Elephants exist to bring glory to God! Kuk-kik, a 14-year-old boy, punctuates his few, slurred words with yelps. Kong screams and bites his fingers when he can’t figure out how much to pay for bananas. Other children freeze mid-motion, fix their gazes on minute objects and withdraw. 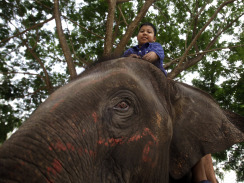 Enter Nua Un and Prathida — two gentle, lively and clever female elephants — and the mood among the autistic teenagers in Thailand changes as they begin their therapy, the world’s first using these charismatic animals. Therapy elephants! How fantastic is that! I know some Biblical scholars believe this isn’t speaking of literal animals but of nations represented by those animals. But right now I’m thinking how exciting it will be if we really get to play with all the animals of God’s creation – because look at those kids living with the confounding condition of autism who get to play with elephants today! Yes, elephants were created for the glory of God! Absolutely! they were created for the glory of God! That passage sounds like God will restore the “Shalom” to his creation, and we will experience the same things our kids do when they do this type of therapy. They experience the glory God gave those animals. 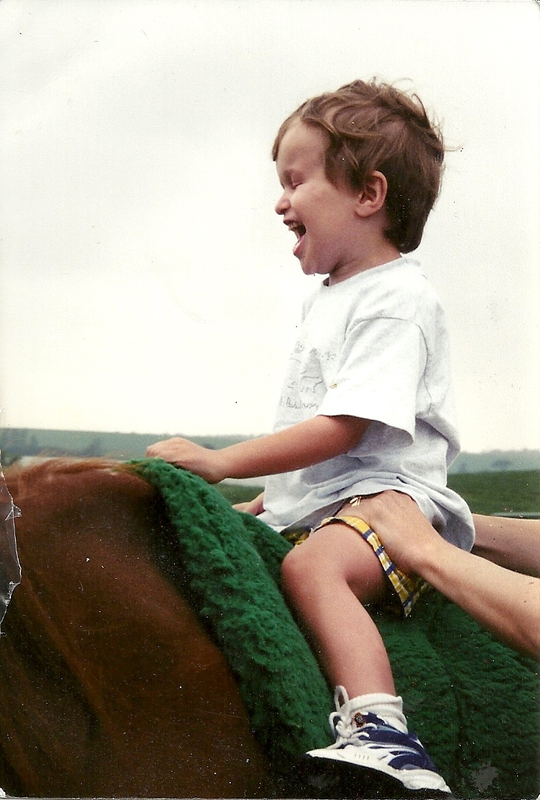 We just get a little picture of the “Shalom” that he intended and I am thankful to him that our kids can experience that now through these glorious animals. Thanks for sharing in the “Shalom” of your boy and these other boys who experienced God’s glorious Elephants. AWESOME! Awesome. My niece is high functioning autistic, but she has trouble interacting apropriately with their dog. An elephant is much hardier and would be tougher for a child to accidentally hurt, I think. How cool. My daughter had equestrian therapy five years ago. We had amazing results from it. It was like she connected in a way with “Dolly” better than any human ever could or would for that matter. Dolly had special place in Addison’s heart. After we spent the day with her horse, Addison’s behavior improved and she was calm, together and at peace with her schedule. God has created these Children in his own likeness to teach us something that we have a tendency in day to day life we over look. My Son is Autistic and I have learned a lot from him what God is doing with us in our home. I can tell you God has bestow over me my son to allow me to grow closer to Him (God) and show me the patience to raise do for him as I’m being blessed doing all this as a single parent for the last 6yrs. Animals are a great sense of therapy for these type of children..
As a follower of Jesus and a school psychology doctoral student who wrote a masters report on treatments used to improve socialization in autism, I feel lead to comment on this post. I very much agree with you that elephants were created for God’s glory and He is glorified when people take pleasure in them as well as His other creatures. However, I think it’s important to recognize that any type of animal “therapy” is not therapy; it will not “cure” a child of autism or any other disorder/condition. Of course they may be very enjoyable to the child, the child may smile or have an emotional reaction for the first time in months when partaking in the activity, and the child may seem like a typically-functioning child in this environment; however, the activity will not have a lasting impact on the symptoms associated with the disorder/condition or the child’s level of functioning in daily life. These same ideas apply to music therapy, art therapy, etc. These “therapies” are not supported by research and would be a waste of money as a means of therapy. Please understand I’m not saying these things are a waste of money in general. All children should be given the chance to experience God and His world in beautiful ways such as this; they just aren’t therapy. I know some people may read this and question how my heavy reliance on research coincides with my belief in Jesus as my Savior; I believe God gives people the abilities and resources to help children who have these disorders and conditions; those abilities and resources result in research. Think about a disease that’s commonly fatal; what if you or someone you loved had cancer? Would you rather use a “treatment” that they will find joy in for the moment (e.g., painting) or use a treatment that has scientific and empirical support for its effectiveness (e.g., chemotherapy)? My bet would be that you would go with the second one and maybe use the first one to improve their quality of life but not as an actual treatment aimed at eradicating the cancer. Autism and other disorders should not be treated any differently. I can’t go through each therapy for each disorder out there that is not effective, so I’m hoping that providing some resources on how to find reliable therapies may have helped someone. Let’s give these kids a chance to thrive in this world without wasting their time and energy or ours. Feel free to comment back with any questions, concerns, comments, or reactions to my post. I do not claim more wisdom, but I have suffered with a neuromuscular disease that left me completely disabled. So I thought I would share. We should always pray for healing. However, God does not always heal here on earth. We who love Jesus will receive the ultimate healing when we see Jesus face-to-face. God did not choose to heal Paul of his affliction, and when one man approached Jesus, Jesus told him, “Your sins are forgiven.” Then He proceeded to heal the man so that they would know He was the Son of God. The focus was on the eternal not the immediate. Pastor David Jeremiah has said, “God will not spare us the temporal at the expense of the eternal.” And Joni Ericson Tada said, (paraphrased) “For suffering to end, God would have to eliminate sin. For sin to be eliminated, God would have to eliminate the sinners. I would rather suffer so that those sinners who do not yet know Jesus might have the opportunity to receive Him as their Savior.” Suffering is so difficult. However, God is SO gracious. Seek His face rather than His blessings, and you will be blessed. May He give you grace as you travel the journey, and recognize the therapy is a form of healing that God has given us through His incredible creation. May God give you peace and great joy as you pray for and love the incredible gift God has given you and your family in your special nephew. Thanks for your reply, I am trying to understand what you are saying but don’t know if I can come to terms with it. We are called to pray “your will be done on earth as it is in heaven” We are to bring heaven to earth. We are to demonstrate the power of God. Are we too good at coming up with excuses and christianese quotes…when God doesn’t heal, to make us feel better about God not healing people? My point being Jesus healed everyone. He brought heaven to earth. He demonstrated the power of God. Are we living with an appearance of godliness but denying its power – 2 Tim 3. Are we settling for something less that what we should? Please hear my heart, I do think God is gracious and do I trust Him no matter what. I just want to take him at His Word and believe that we can do what He has said we can do through the power of His spirit. There are many Christians suffering from diseases and conditions who never see healing in this life … even though I am sure they, along with many others, have prayed ceaselessly for healing. God is sovereign over all of these things, and the Bible says that, ” … all things work together for good to them that love the Lord and are called according to his purpose” (Romans 8:28) – this would include disease and incurable conditions too. Yes, Jesus heals … and God continues to astound and surpass the earthly wisdom of our medical system by healing some when all human effort has failed. However, God does leave some of His children (like Joni Ericson Tada and many others) with conditions that restrict them – conditions that test and try their souls. How else could this be explained other then affirming that God does this sovereignly and for a purpose? Dylan, I want to agree with what both Dawn and Sarah have said and to make one more point in response to your first post. Yes , we can pray for healing but I believe even more important is to pray for the grace to remain faithful as we go through the dark times. And I have to disagree that Jesus healed everyone. Many times he told those he healed not to tell anyone. Why did he do that? Because if the word spread he would have spent his whole ministry doing nothing but healing people. That was not why God sent his Son to earth. I work with 6 autistic children as their teacher. They are wonderful children who teach me more than I teach them. Yes, life is difficult for them and their families but I’m pretty sure not one of those parents would trade their child for a ‘healthy’ one. yes there will be struggles with your nephew too but God’s grace is sufficient. Lean on Him and He will see you through. But your god created imperfect people in the first place. Praying won’t make any difference either. Either you accept that we are in charge of our own fate and there are no interventions from God or you accept that god knows everything and everything that will happen to you is already pre-determined.